Though my taste buds are acute, my eyesight is crap. And during my last eye exam, I came to find out that my doctor is a wing enthusiast as well, so we start talking wings… how to eat them, where to go, how hot we like them, the normal chatter. He tells me that if I am ever in the Swedesboro area that I need to swing into a little place known as Rode’s Fireside and try their Buffalo wings out for size. This sounded like a plan, so I wrangled up the family and headed down for a nice dinner out. This place is off the beaten path a bit, and they have signs directing you from the main road to ensure you don’t miss them. I often see signs like this for amusement parks, resorts, and national landmarks, so my mind relates the two and makes me think that I am headed somewhere special. I arrived at Rode’s (Pronounced Rō-dees) and was expecting a little hole in the wall, but instead was facing a nicely constructed modern looking bar. We walked past the main area and were seated out on the screened-in porch that had been converted for the winter time with heaters and nice tables. One nice perk about this restaurant was the fact that it was kid friendly (complete with kid’s menus and crayons), so I could bring the wee ones and not feel out of place. The menu offered up three Buffalo style variations: Mild, Hot, and Extra Hot. I asked the waitress how the Hot related to a normal medium sauce in which she replied that the chef will mix it up however hot I would like. I didn’t want them to make anything special for me because I want to taste things as they come normally, so I ordered them Hot with a side of the Extra Hot. I just thought it was nice that they would go outside their box to cater to the customer, and that’s always a plus. When the wings arrived, they didn’t look like anything fancy. They were non-breaded, coated decently with the sauce, and had a nice pool of the drippings on the bottom which was perfect for dipping. The meat was pretty standard with the size being slightly larger than the norm. But once again I get that familiar smell and taste that leads me to believe they use Frank’s as the hot sauce. Now, I don’t have a problem with this normally, because Frank’s is an awesome sauce, but when you have a product that claims to be Famous (as these wings do), I expect more from the sauce. They can’t just ride on the coattails of Frank’s alone. 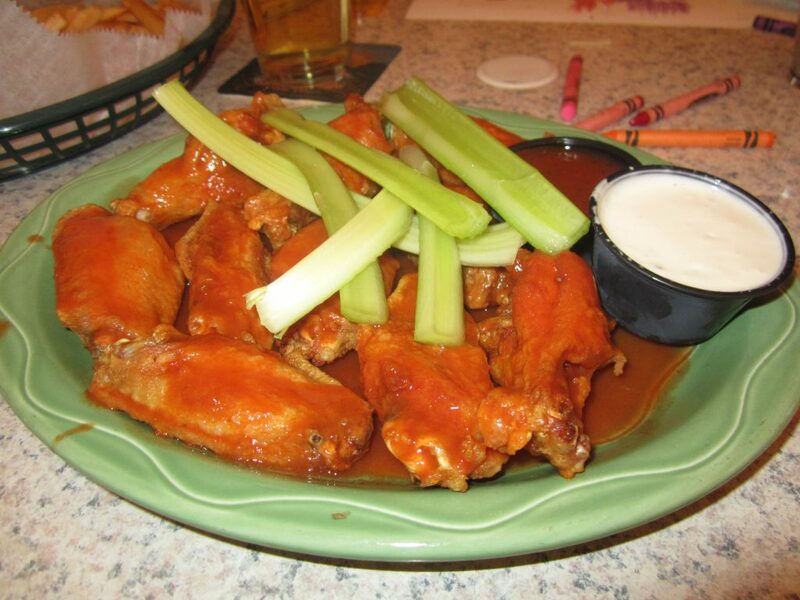 I think that if a bar claims to have famous wings, then the sauce should either be made from scratch, or at least start with a brand name as a base and mix in some other ingredients and spices to make it unique. The Extra Hot sauce was also a bit odd as it wasn’t really that much hotter. It did bring in more garlic and black pepper, but overall didn’t have much Buffalo flavor and didn’t mesh well with the other sauce when I tried to mix them. I would just stick with the Hot and order some fries for something extra (though you’ll have to salt the hell out of them because they were pretty bland as well). The wings were tasty, and if I lived in the area, I would probably frequent the bar for its friendly staff and atmosphere. But I don’t feel that this was worth a special trip just to get these “famous” wings when there are plenty of other places that offer more than just the standard ingredients. I don’t know what Chris really saw in those wings, but I think it may be time for a new prescription (get it… ’cause he’s an eye doctor).